United Recreational Vehicles, LLC (URV) is dedicated to providing high-quality RVs to our customers. URV is the registered and sole representative for CenTech Specialty Vehicles Co., Ltd. (CenTech) in the United States. 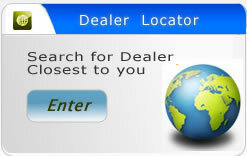 Based in China and established in 1995, CenTech is the largest manufacturer of specialty vehicles and RVs in Asia. Its RVs are sold in countries across the globe, such as Australia, France, Japan, South Africa and the US. URVs recreational vehicles are available through a network of independent RV dealers throughout America. URV's products, including the iCamp Elite travel trailers and iCamp Lite folding tent campers, are engineered to meet the needs of todays outdoor enthusiasts. For example, our RVs are remarkably lightweight and aerodynamically designed for easy towing and fuel-efficiency. Our vehicles offer an exceptionally stylish exterior and compact yet comfortable interior, with numerous standard and optional features to make your journey on the road more enjoyable. In addition, our RVs are well-constructed with high-grade materials, and many of the RV components are American-made and warranted. 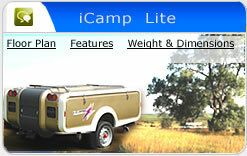 Our trailers and tent campers meet all US federal and state requirements for recreational vehicles. Our company is also a member of the Recreational Vehicle Industry Association (RVIA), and our RVs are inspected by this US trade group and bear the RVIA seal. URV is committed to providing quality RVs to its customers, and all of our vehicles come with a company warranty. At URV, were dedicated to helping you explore the great outdoors while enjoying the comforts of your home.
. In 1995	CenTech Specialty Vehicles Co. was established.
. In 2001	Produced the first motor caravan in China. CenTech also participated in the proposal of Caravan Industry Manufacturing and Technology Standards in China.
. In 2003	Earned ISO 2000/2001 certification.
. In 2003	Exceeded the requirements of CCC National Quality Control Certification.
. 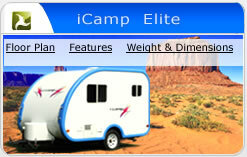 In 2004	Participated in the proposal of RV industry business operation standards in China.
. In 2005	URV was formed and serve as the registered and sole representative for CenTech and bring new concepts to the US RV market.